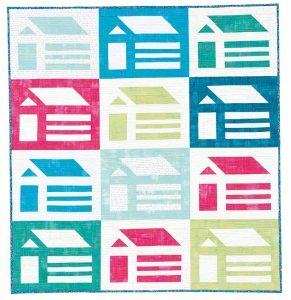 This sampler quilt is a new and exciting ten-month block of the month program – all in one reasonably priced book! 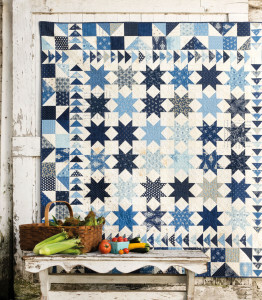 Due out in February, Summer Moon is made up of 72 blocks. But, here is what makes this book different! 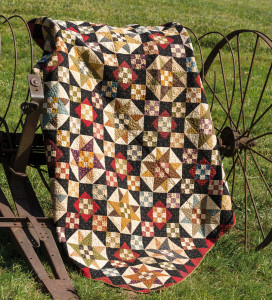 The quilt is made up of 72 blocks set eight by nine. 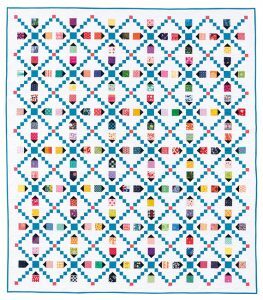 Each block is repeated three times in three different sizes so there are actually 24 different blocks in the quilt. 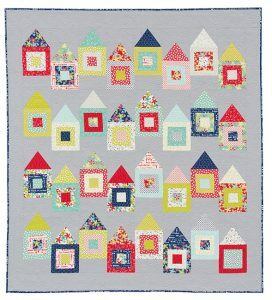 The finished 4 1/2; 6 and 7 1/2 inch blocks are framed when needed so they all finish to the same size and can be set together with straight rows – it only looks complicated! 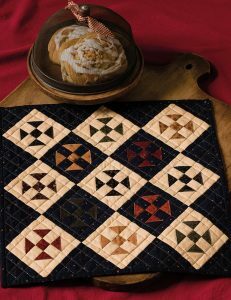 Setting it together this way, however, adds movement and interest to the quilt. You can use the same background for all of the blocks or add texture by using different ones. 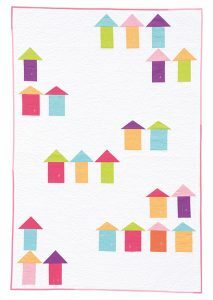 Each month, the nine blocks use the same background so it is easy to cut and kit. The 72 blocks are completed in eight months. The remaining two months are needed to complete the frames for the smaller blocks. 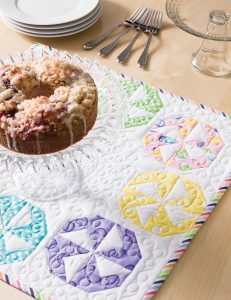 What a clever and original concept for a sampler quilt! This book is not due out until November, but I don’t care! I am a huge Carrie Nelson fan and immediately saw this book’s potential! What a fun holiday display! As soon as the book arrives, have each member of your staff make a sample. 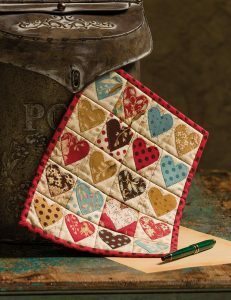 With 40 to choose from, they are sure to find one they love! If you don’t have a big staff, ask your favorite customers to come in and help you make samples – you provide the fabric for two. They keep one and give you one to display. 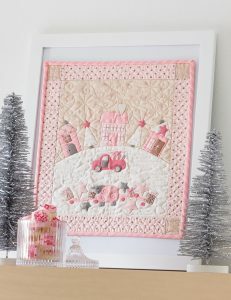 Then have little bundles of fabric stacked under a tree so you can add your own personal touch. Don’t forget to have plenty of ground walnut shells on hand for stuffing. The book, a bundle of fabric, and some walnut shells would be a great gift. But making the pincushions would be wonderful as well! Why not start a pin cushion club? 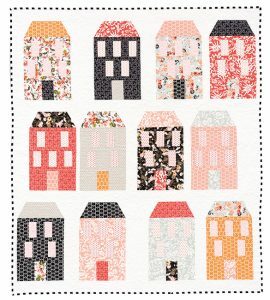 You can teach a different technique – or two – each month and actually go home with a finished project! Put on your thinking cap because the possibilities are endless! What about the classiest Corn Hole bags ever????? 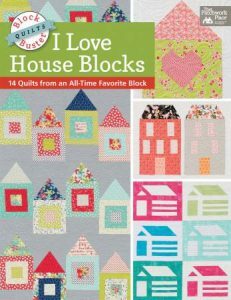 I Love House Blocks is a compendium of fourteen quilts created by many of your favorite designers. 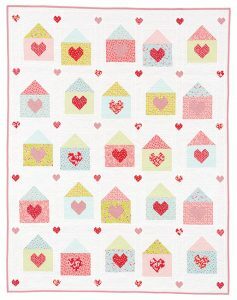 Part of the fun is guessing who designed which quilt! Whether modern or traditional is your style, this book is for you. A picture is worth a thousand words. In this case, fourteen pictures will make this a must have! 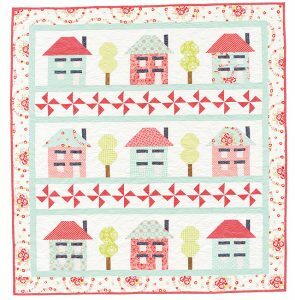 Why not make a personalized quilt that showcases the houses that you have called home! 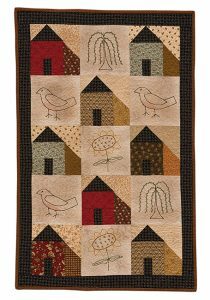 Several of your favorite designers: Pat Sloan, Carrie Nelson, Brigitte Heitland, Camille Roskelley, Me and My Sister Designs, Sherri McConnell, Sandy Gervais, Edyta Sitar, Lynne Hagmeier, Vanessa Christenson, Anne Sutton, Laurie Simpson, Jen Kingwell, Lisa Bongean, and Betsy Chutchian. 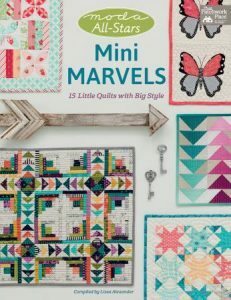 contributed to this top-selling book: Mini Marvels. 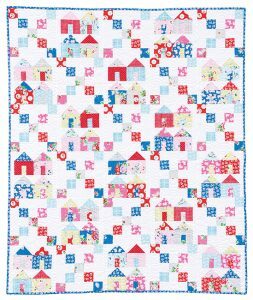 All of these designers have such a recognizable style that it is fun to guess who made each quilt – no peeking! Once again, the photography showcases these beauties to their best advantage – and makes you want to start cutting up that stash immediately! Don’t forget! 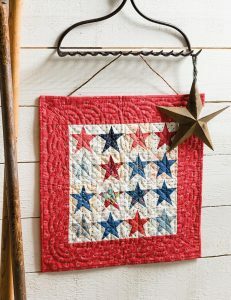 I know I mentioned this in Part One, but it bares repeating!If you are hanging them on a wall, you may want to consider using Soft and Stable for batting. 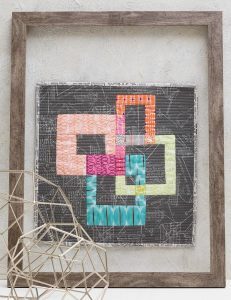 They will hang perfectly flat and add that professional touch! 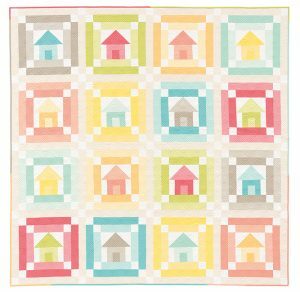 It comes in several packaging options: Project Packs which include four 13 1/2 x 18 1/2 inch pieces (originally meant for place mats but perfect for minis), 1/2 yard cuts; 1 yard cuts; etc. Why not display these packaged options next to a display of minis??? 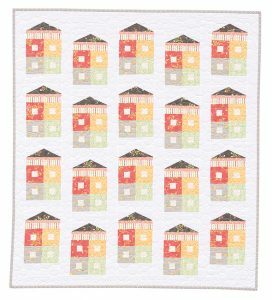 Creative Grids® has several rulers that may help you along your miniature journey. They have put together a booklet entitled “Love Mini’s” which shows a wide variety of tools available to create small units. Help your customers find the right tool for their mini projects! 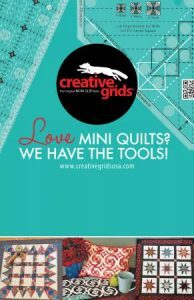 There is also a tri-fold available to help your customers keep track of the Creative Grids® products they already have… or want! Be sure you keep a supply next to your cash register or Creative Grids® display. Newest rulers are listed in bold on the list – so be sure to replenish new brochures every spring and fall. I love everything by Carrie Nelson. 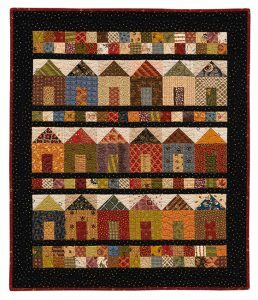 She is one of the queens of scrap quilts. I told you about this book a few weeks ago – sight unseen – but now I have photos. My personal rule of thumb? 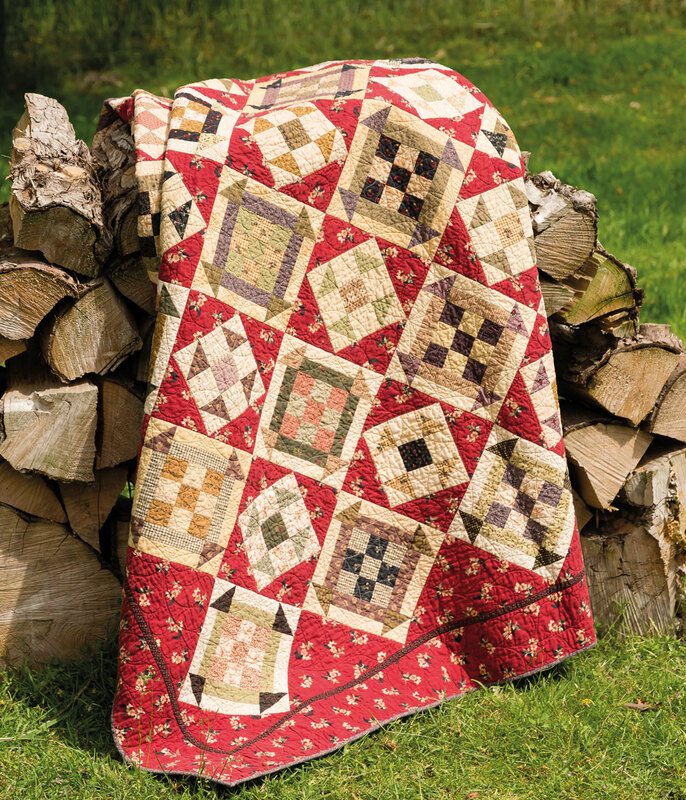 If I see four quilts in a book that I want to make, it is worth it – and in this case, I want to make them ALL! 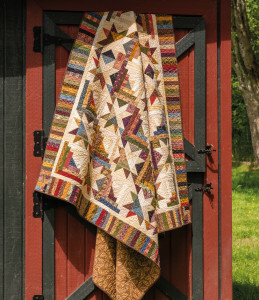 The book includes a collection of twelve of her favorite patterns. Start with the cover quilt! What a great setting for nine-patches! 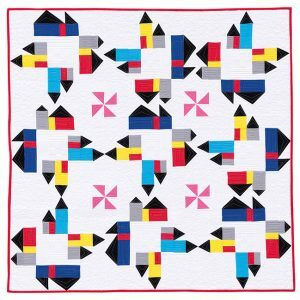 Combining nine patches and churn dashes? 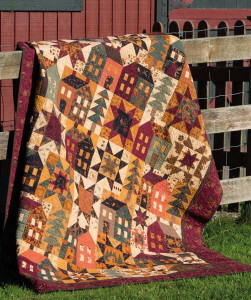 And houses and flying geese trees? Pure Genius! Who doesn’t love stars? And half stars – combined with log cabin blocks? Even better! Place your order today so you will be one of the first to get this treasure! Our buyers need to know so they can order enough to meet your needs! I normally don’t encourage you to buy books sight unseen but these women are legendary – and, based on their reputations, you want to order now so you are guaranteed to get the first shipment! And, I mean this literally because no pics have yet been released! Some are not due out until February but I am ordering my copies NOW! 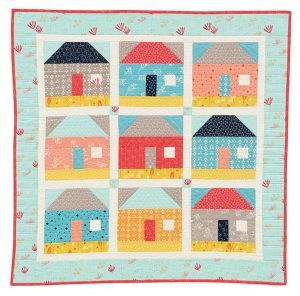 Kim Diehl and Jo Morton are joining forces to create 14 spectacular quilts all based on classic blocks. These women are sensational alone so I can’t wait to see what happens in this collaboration! 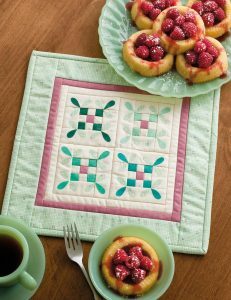 Simple Friendships is aptly named! 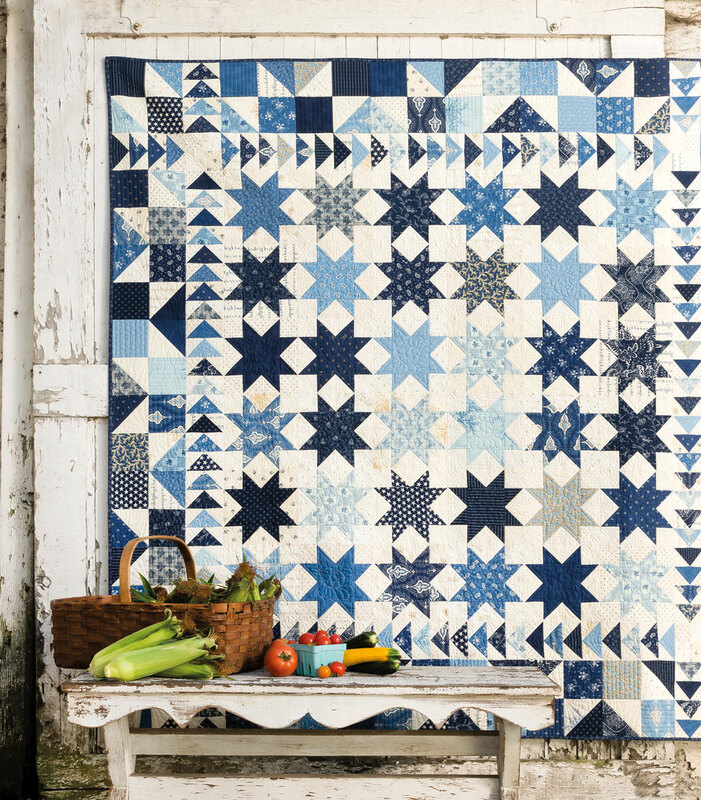 Carrie Nelson of Miss Rosie’s Quilt Company is releasing twelve of her favorite quilt patterns in one collection! 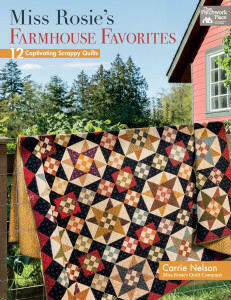 Miss Rosie’s Farmhouse Favorites is sure to be a compendium of exceptional scrap quilts. 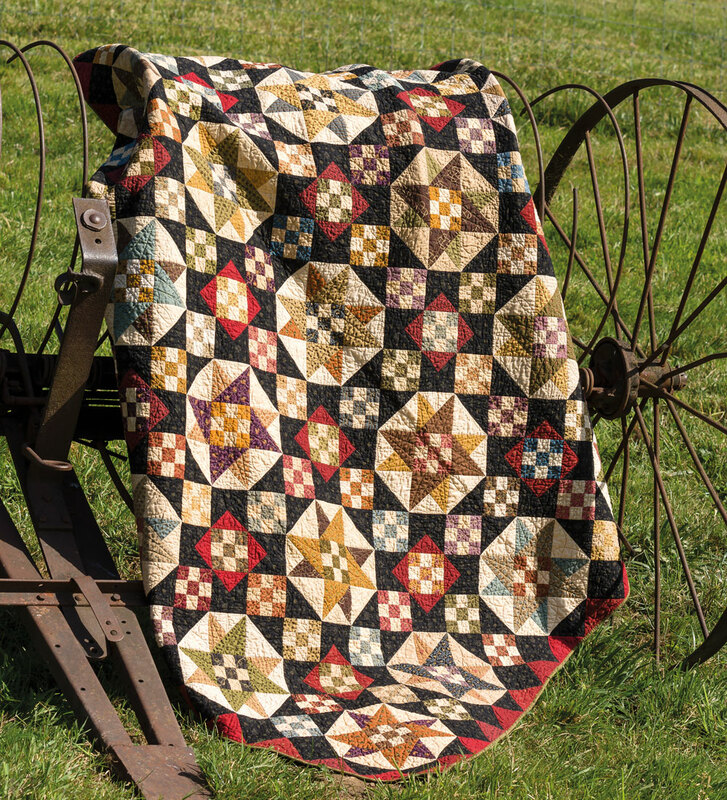 She has such a talent for combining literally hundreds of fabrics into stunning quilts – studying her projects is comparable to getting your masters in color and design! You already know who will want these so order accordingly!